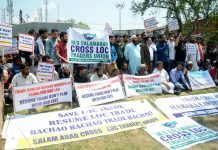 Previous articleSecretary Tourism, Rigzin Samphel and Director Tourism Kashmir, Tasaduq Jeelani presenting special traditional tea pot to Bollywood Actor/Director Manoj Bajpayee at Srinagar on Wednesday. 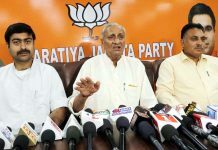 Next articleLIC Chairman, VK Sharma, along with other officers launching new plan ‘Jeevan Shanti’. 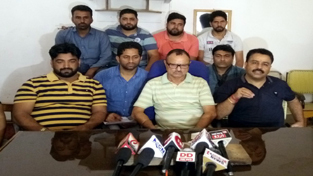 Directors of Jetking Jammu, Amit Kaushal and Naveen Sharma, posing with students placed in various IT companies. 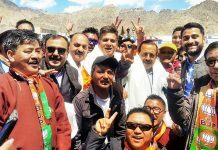 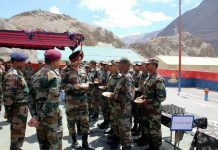 Union Minister Dr Jitendra Singh, flanked by BJP State president Ravinder Raina and senior party leaders, on arrival at Leh, on Monday. 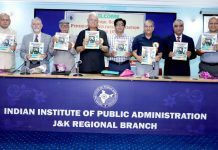 Pensioners’ Journal being released on the occasion of 24th AGM of CGPWA on Monday. 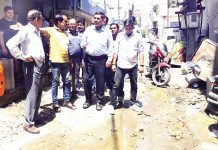 JMC Mayor, Chander Mohan Gupta along with others during a tour of Bakshi Nagar area in Jammu on Monday. 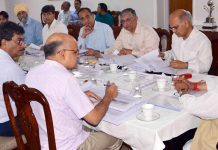 Governor, Satya Pal Malik chairing a meeting of Board of Directors of JKSPDC in Jammu. 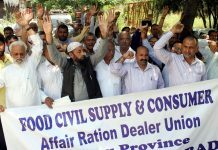 Ration dealers of FCS&CA Department taking out a protest in Jammu on Monday. 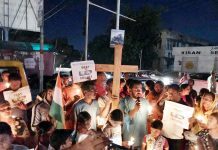 Christians in Jammu during a candle march to pray for Sri Lanka terror attack victims. 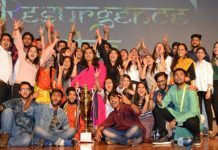 Students posing alongwith trophy during Annual Cultural Fest, Resurgence 2019 at Katra.